G. E. Bentley, Jr. *↤ G. E. Bentley, Jr., recently edited and annotated A Handlist of Works by William Blake in the Department of Prints & Drawings of the British Museum for the Newsletter. He is the editor of Blake’s Vala or The Four Zoas (1963) and of Blake’s Tiriel (1967); compiler of The Blake Collection of Mrs. Landon K. Thorne (1971) and, with Martin K. Nurmi, of A Blake Bibliography (1964); author of The Early Engravings of Flaxman’s Classical Designs (1964) and of Blake Records (1969). Increasing interest in William Blake has been accompanied by, perhaps has caused, the discovery of a number of previously unknown engravings signed “Blake”. Six were found in The Seaman’s Recorder (1824-27),1↤ 1 “Byron, Shelley, Wordsworth, Blake, and The Seaman’s Recorder,” Studies in Romanticism, 9 (1970), 21-36. Sir Geoffrey Keynes “defend[s] his [Blake’s] reputation against . . . [this] mistaken attribution” in “Blake’s Engravings for Gay’s Fables,” Book Collector, 21 (1972), 60. I agree that the “Blake” whose name appears on the Seaman’s Recorder plates often exhibited lamentable craftsmanship there. The crux of the matter appears to me to be that the poet William Blake is the only engraver known to have been signing “Blake” to plates at this time—the writing-engraver William Staden Blake (fl. 1770-1817) is not known to have worked so late (see “A Collection of Prosaic William Blakes,” Notes and Queries, n. s. 12 , 172-78). two more in James Earle’s Practical Observations on the Operation for the Stone (1793, 1796, 1803),2↤ 2 Leslie F. Chard, “Two ‘New’ Blake Engravings,” Blake Studies (1973). This and the next essay were generously shown me by their authors in draft. and yet another is in Henry Emlyn’s Proposition for a New Order in Architecture (1781, 1784).3↤ 3 William A. Gibson and Thomas L. Minnick, “William Blake and Henry Emlyn’s Proposition for a New Order in Architecture: A New Plate,” Blake Newsletter 21 (Summer 1972), 13-17. All these are in recently noticed and obscure books. Doubtless more such backwater-books will be found with plates by the poet in them. Blake made engravings for some seventy-seven books, and all except those named above are well known and have repeatedly been pored over by scholars for their Blake significance. However, in one of them, John Caspar Lavater’s Essays on Physiognomy, there has lurked, undetected, a plate not only perfectly characteristic of Blake in form but signed, minutely but legibly, “Blake Sc” [illus. 1]. The reason why the design has been so long overlooked is quite simple: the signature is not in the normal place, below the design, but is in a gap in the foliage near the foot of the right-hand old man, and it is so small (c. 0.4 × 0.05 cm.) that it is very difficult to find and almost impossible begin page 49 | ↑ back to top to read confidently without a magnifying glass. Once it has been located,4↤ 4 It was in a list of the Blake holdings of the Osler Library, McGill University, generously sent to me by Miss Ellen B. Wells, Acting Osler Librarian. however, its presence, details, and significance are unmistakable. There can, I think, be no doubt that this “Blake” plate was engraved by the poet, for not only did he sign other plates in the same volume (Vol. I, pp. 159, 206, 225) which have never been challenged, but the design itself seems to me to be characteristically Blakean. It is a small tail-piece (platemark: 8.5 × 6.1 cm.) 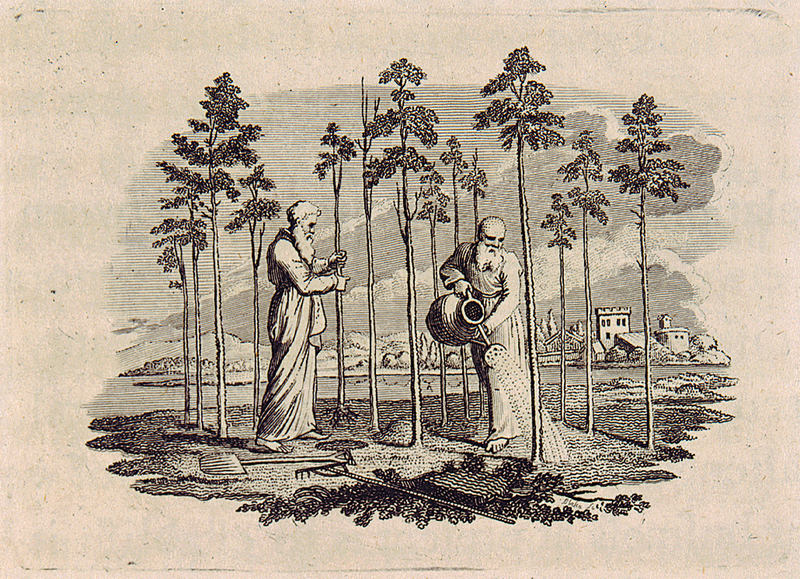 of a decorative rather than a demonstrative nature, representing two old men with flowing white beards and long gowns apparently planting a grove of some fourteen young trees; the man on the left seems to be putting a tree in the ground, the man on the right, who is bald, is watering another tree with a large watering can, and in the foreground are a rake and a shovel on the ground. Behind the little grove of trees is an open space which may be water, and in the distance among low hills and trees are buildings, one of which may have a crenellated tower. 1 The “new” Blake engraving from Lavater’s Physiognomy, signed, near the right-hand man’s foot, “Blake Sc”. This is an enlarged reproduction; the true dimensions are 8.5 × 6.1 cm. Reproduced by the permission of the University of California, Berkeley. (1789), For Children (1793) pl. “11,” “13,” “15,” “The Little Vagabond,” “London,” and “To Tirzah” from Songs of Experience (1794), and “Joseph of Arimathea Preaching” (1794). Even the young trees are not unlike those in the background of Blake’s Tiriel designs and elsewhere. If the form is not all Blake’s, he may yet have adapted a design by another artist into one virtually his own, as Sir Geoffrey Keynes has shown us6↤ 6 “Blake’s Engravings for Gay’s Fables.” he did with that for “The Shepherd and the Philosopher” in Gay’s Fables (1793). Lavater’s Physiognomy was originally issued in forty-one folio parts at irregular intervals. The “new” plate appeared in Part V, issued in July 1788, and was described on its cover as “Aged Figures, Gardening”. The whole work was issued in three-volumes-bound-in-five, and the “new” Blake plate is in Volume I (1789), page 127. The three-volumes-in-five were published again in 1810. Whether or not the plate was designed by Blake, it is one of the earliest examples known of the patriarchal figure who presides over his work. The design is either one of the first examples of, or a stimulus for, what seems now a characteristically Blakean type.